Distraction osteogenesis is a procedure that moves two segments of a bone slowly apart in such a way that new bone fills in the gap. The procedure, which has been around since 1903, gained recognition in the 1960s through the work of Russian surgeon Dr. Gavril Ilizarov to treat bone problems in the leg. In 1992, distraction osteogenesis was performed successfully on a human mandible (lower jaw), and since the mid-1990s, it has been used to treat midface hypoplasia (abnormally slow growth of the upper two thirds of the face). It is no longer an experimental procedure. 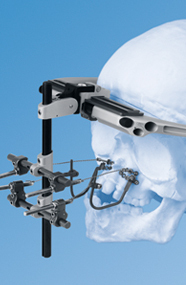 It is performed at major craniofacial centers across the country with FDA-approved distraction devices. In distraction osteogenesis, a surgeon makes an osteotomy (break) in an abnormal bone and attaches a device known as a distractor to both sides of the osteotomy. The distractor is gradually adjusted over a period of days or weeks to stretch the osteotomy so new tissue fills it. Once the bone is in the desired position, it is held in place and the regenerated tissue is allowed to heal and turn into new bone. The method forms a longer bone from a shorter one. A child’s parent or guardian turns a screw on the distractor after they have returned home from the hospital to stretch the osteotomy. The stretch is so slow (generally about 1 mm per day) that it does not usually hurt the child. Older children say that the stretching is less painful than braces or orthodontics. What is amazing is that the stretched, regenerated tissue forms into new bone over the next two months by itself. Once the new bone is strong enough, the surgeon removes the distraction device during a very short second operation. In the past, lengthening the jaw, for example, involved a longer surgery that required bone grafts from the rib or hip. What type of distraction osteogenesis is done at Children’s? The maxilla (upper jaw) in a small number of children born with cleft palate does not grow as well as the rest of their face, leaving the upper teeth behind the lower teeth. If the difference between the two jaws is big enough, we recommend distraction osteogenesis to advance the upper jaw to a better position. An external distraction device is attached to the patient’s scalp using a series of pins. The device remains in place after the surgery to move the upper teeth and the surrounding bone forward to the correct position (approximately two weeks) and then to hold the jaw in place until the bone heals in this new position (generally six to eight weeks). The patient wears the device for two to two and a half months. Dr. Mark Egbert, our oral surgeon, is very experienced in this technique, and with the help of our orthodontists will determine whether the Le Fort I advancement needs to be done using distraction osteogenesis. In craniosynostosis syndromes such as Apert, Crouzon and Pfeiffer syndromes, the child’s entire upper face does not grow properly, which can cause problems with breathing, sleep, sight and chewing. In a select number of these patients we recommend Le Fort III midface advancement, a full-day operation that requires several days in the intensive care unit for recovery. The mandible (lower jaw) of children with certain craniofacial conditions does not grow properly, which can cause problems with breathing (because the tongue is pushed to the back of the throat) or chewing (because the lower teeth bite far behind the upper teeth).